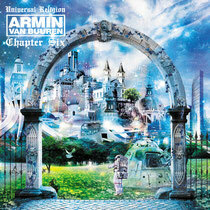 Armin van Buuren has released his brand new compilation, ‘Universal Religion Chapter 6’. The mix-album, for which artist Joseph Klibansky created the artwork, was recorded live at club Privilege in Ibiza, where van Buuren has his own weekly residency. The latest edition of his ‘Universal Religion’ series, that has been running since 2003, has entered the Top 10 iTunes album chart in countries such as the US, Mexico, The Netherlands, Canada and Germany. Recorded in the presence of thousands of clubbers during his A State of Trance night in Europe’s biggest club, Privilege, van Buuren hopes to have translated the Ibiza summer feel through the two mixes. The artwork, like last year’s edition of the ‘Universal Religion’ series, was designed by upcoming artist Joseph Klibansky. He translates the feeling that the music brings to an artwork that breaths both his typical ‘new urban wonderland’ style as well as the philosophy behind ‘Universal Religion’. With lots of exclusive content and unreleased tracks and remixes, as well as Armin van Buuren’s new single, ‘I’ll Listen’, you can grab it at all reputable download stores.